Superconversations Day 64: Sam Samiee responds to Coco Fusco, "The Revolution is Dead - But Long Lives the State!" 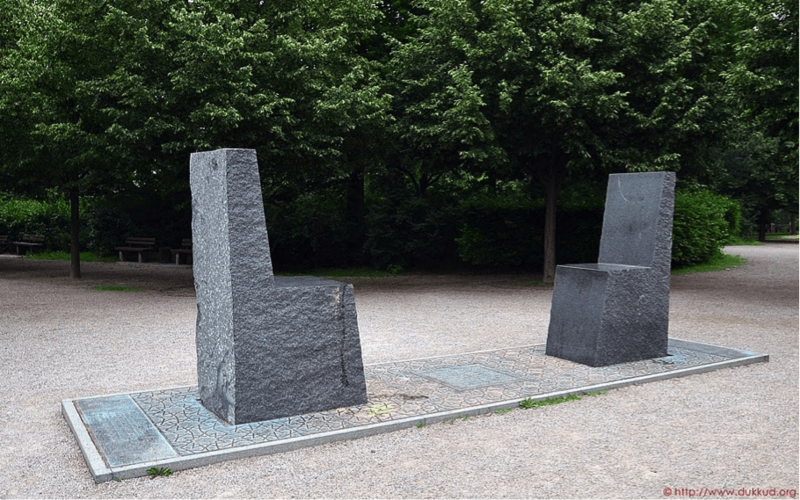 The monument dedicated to the encounter between Goethe and Hafiz, Ernst Thevis, 2000, Ilm Park, Weimer, Germany. Transformation in our ways of taking in the message, gift, shout, poem or actions of the other don’t happen merely by translation. Attaining the level of metapolitics is what I read as the core suggestion of Coco Fusco’s “The Revolution Is Dead – but Long Lives the State!”. To understand revolution, redemption, resistance and the other keywords mentioned with fresh eyes, we can draw a lot of lines between every single situation that the text explains about Cuba to a similar Iranian situation, in the post revolutionary Iran —metapolitically, of course. For a long time the Cuban revolution, resistance, political life and the destiny of its citizenry had been the source of inspiration for the Iranian subjects. Beyond all, it seems that when the subjects of the global South meet each other and succeed in overcoming Western mediations, achieving imaginative understanding is really not that difficult. Post-literature-dynamism doesn’t only need an able poet to produce a literary product, but a reader who can creatively distinguish between ‘literally’ and ‘literary’. A fantastic example of misreading can be traced in the ‘Western-Eastern Divan’ by Goethe. An Homage to the Persian Poet Hafez, Goethe expresses his deepest love to Hafez’s poetry and acknowledges his indebtedness to him. Yet, reading Goethe leaves one doubting if he has was able to fly above the text and understand the context in and for which Hafez was writing. The excellence of the imagination of a poet like Goethe is not arguable, but his failure (and the failure of his successor up until now) in reading Hafez should remind us of the unseeable, untrackable dynamism which poetry has had and still has for Hafez and his readers in Persian. Probably Goethe never realised that Persian speakers already, by the time Goethe was reading Hafez, were keeping his poem book next to the Holy book. The dominant mode of relationality between the author, reader and their time and space is the result of the epistemic sovereignty. These alternative modes of relationality were always there and are not new to our time. My question is how one wants to enlighten the Western and the Westernized reader about the misreading and warn them about their possible cannibalistic reading of others? How can one reactivate the post-creation-dynamism(s) that a good juicy poem from a Cuban poet contains? In other words, the Cuban artist and poet (why are we distinguishing the poet and artist? ), the one with a metapolitical capability and sensibility is already making or doing whatever she has to do (and if you doubt it, read Fusco’s text again). But how can the creative citizen in charge, address the readership and avoid the similar appropriation that has in the very first place caused the problem of ‘fascination rejection’? How could one translate one context into another? Sam Samiee is an Iranian Amsterdam-based painter and essayist, currently a resident artist in the two-year program at Rijksakademie van Beeldende Kunsten.